Our new chicks are here! 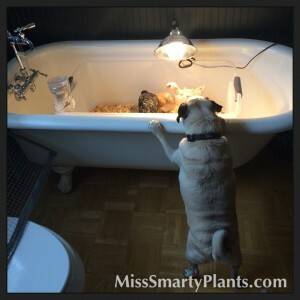 I am happy to announce that we brought home our four new chicks and all are doing well and are getting their start in our bathtub– much to our pug’s delight! We were lucky enough to find a breeder that has many different breeds hatching at the same time so that we can have a variety. Yes, this is not the method a true farmer would follow, but I want to be able to tell them apart and call them by name. Bringing home new chicks is SUPER exciting. The peeping from the box in my lap on our drive home was almost more than I could take! 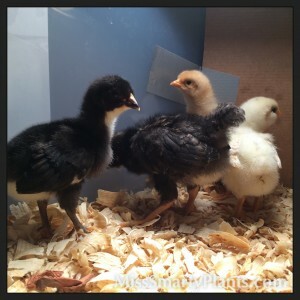 We were able to get four chicks: one Black Copper Maran, one Ameraucana, one Buff Orpington, and one Barred Rock. Oh yes, we are a diverse group here! The Barred Rock is about five days older than the others and its amazing to see her almost twice as large and know that the others will be that big shortly. The 100-watt lamp in the cage has been hung so that it creates a temperature between 90-95 degrees. I continue to watch the little chicks to see if they are huddled under the light (obviously cold and the light needs to be lower) or if they are off to the side and spread out (probably too warm and the light can be raised). I won’t lie, I woke up in the middle of the night the first evening to check them! Luckily, I have my hand helper, Capone who also likes to run into the bathroom and check them too. Here is a photo of our little Ameraucana chick. She is a light yellow color and, even though it is hard to see in this photo, she has little “ear muffs” that look like little puffs on the sides of her face. 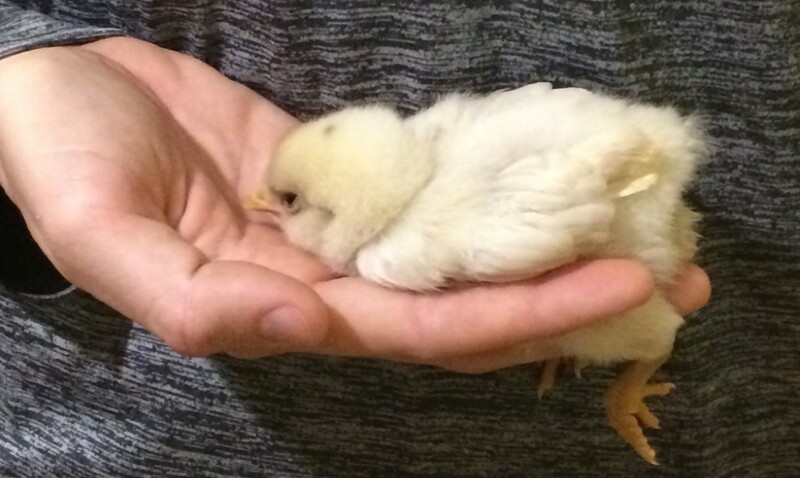 Holding new chicks is easy and also very important if you are going to have tame chickens that you can handle. You can see here how our little chick was fine just being held without restraint. 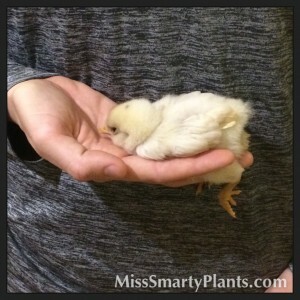 Simple have the chick “straddle” your fingers with the chick’s breast resting in your hand. The chick will feel secure and having the legs between your fingers allows you to maintain control and keep the chicks from moving too much. Starting your chicks with this right away will get them used to you holding them and create a tame hen. We’ve been making a conscious effort to pick up each of them every day. The chicks will stay in our bathtub until it is warm enough for them to go outside. It is recommended that the chicks have the temperature reduced by 5 degrees each week as they get older. As the weather warms we will even move them outside for the warmer days and bring them back inside in the evening. Yes, I have the best husband in the entire world to let us have chicks in our bathtub and not have an end date.